Uber is almost an institution in many of our daily lives, much like Google, Amazon, or Apple. But even though many of us may simply think of Uber as the name that fulfills many of our transportation needs, it is still a company – it has offices, hires people, fights for its rights, and makes corporate policies and decisions. To this end, over the last several years Uber has been making headlines, and one reason for this is that the way in which Uber classifies its drivers has come under heavy scrutiny. In the past, Uber has been involved in heavy litigation in order to classify its drivers as “independent contractors” as opposed to employees (discussed further below), and a recently settled case involving this very issue will have a lasting effect on this classification. The IRS treats independent contractors and employees very differently for tax purposes. 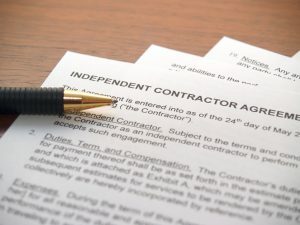 According to the IRS, an independent contractor is a person who has a high degree of control over their work . Independent contractors are also typically not offered benefits.